Saturday August 4th 1923 I did the work and read in forenoon about President Hardings death. I was ready to go to town with Ron after dinner to make calls but it began to rain. Mrs Searles came and Hattie read aloud to us all afternoon. Had supper with the folks. Evening with Hattie. Sunday August 5th 1923 Hattie and I to church with Ott. I had dinner with her. Rob away for the day. It began to rain early in afternoon. Later I went out to Hedges for a call. Monday August 6th 1923 I wrote to Winnie & Betty in the AM. Hattie and Fannie at Mrs Swishers. I rode to town with Rob after dinner and paid bills. Then out to Aunt Emmas and Ida Anderson. I rode home with the girls. After supper Rob took Ott, Fannie, Hattie & me to ride. very warm. Tuesday August 7th 1923 Busy in AM with my own affairs. Hattie had Mrs Shultz, Clara, Dorothy and daughter with Fannie here for the day. Rob away in the PM. We ate supper in my part of the house. Both home in evening. 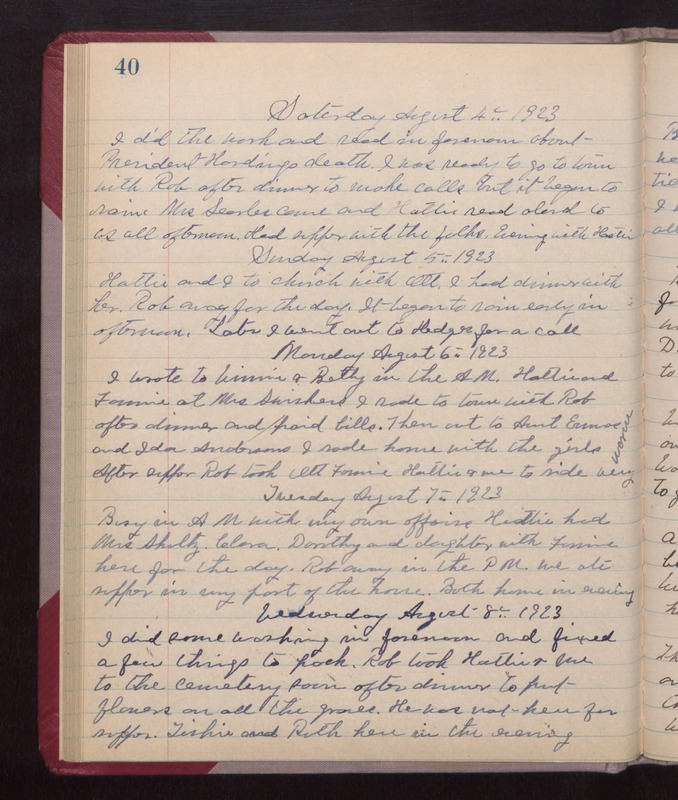 Wednesday August 8th 1923 I did some washing in forenoon and fixed a few things to pack. Rob took Hattie & me to the Cemetery soon after dinner to put flowers on all the graves. He was not here for supper. Tishie and Ruth here in the evening.